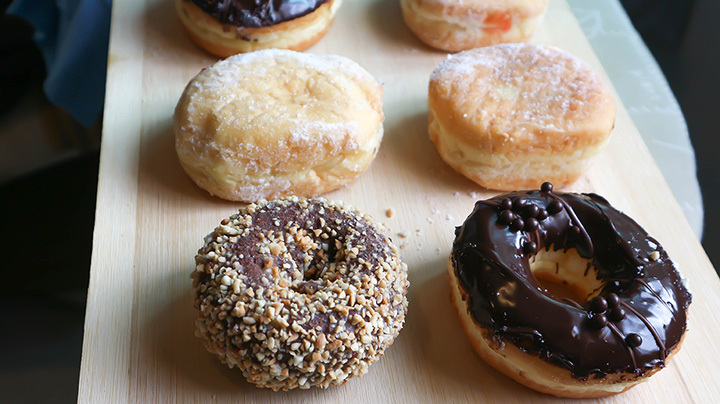 When it comes to pleasing your taste buds, doughnuts have an all-star reputation. They’re also pretty flexible when it comes to flavor and topping options: From glazes and sprinkles to frosting and fillings, doughnuts give you plenty of options to fuel your sugar cravings. Find all the sweet, doughy variety you can imagine (and more) at one of these 10 best donut shops in South Carolina. Here you can find savory doughnut creations you never knew existed, all crafted with care and a high caliber taste. You can expect fun flavors like orange pistachio, s’mores, and German chocolate to become your new favorites. Even the pickiest doughnut eaters can get exactly what they want here, as each doughnut is specially crafted to your exact specifications. They start with a basic doughnut cake, then you choose the toppings (key lime or Srirachadoughnut, anyone?). This is South Carolina’s only location of the six-location chain. This family-oriented hometown gem features doughnuts that are lovingly made from scratch each morning, ready to help you power through whatever your day throws at you. And they taste just as good as they look! You can also find a variety of other tasty breakfast foods, like cinnamon rolls, tiger claws, and apple fritters. This is your ultimate sweet snack spot. Serving up a huge variety of doughnuts, you can also find bagels, breakfast sandwiches, frappes, cappuccinos, chai tea lattes, fruit smoothies, and more. Murray’s Donuts lives up to the hype. These delightful, melt-in-your-mouth rings of sweetness should really be their own food group—nothing else compares. With a huge focus on fresh, you’ll appreciate the difference here. They have their own unique set of recipes that go to work each morning in preparing made-from-scratch doughnuts and other breakfast favorites to sate those morning sweet cravings. If a doughnut could be even the slightest bit healthy, it would be the vegan doughnuts you’ll find at Nana’s Donuts. These doughnuts break through the common idea that vegan treats can’t be sweet, scrumptious and healthy. Not exactly your traditional doughnut shop, you save time and pick up both breakfast and lunch in a single stop. Aside from their extensive, unique deli options, you can find a good selection of doughnuts ranging from classic glazed to funky treats like maple bacon. Best doughnuts ever? The loyal fans at Rainbow Donuts think so. Here you can grab a fresh variety of doughnuts, along with an eclectic offering like apple fritters, cake, burritos, hot dogs, and breakfast sandwiches.